© 2016 text and photo. All rights reserved. Except for the swerving, chaotic traffic in Hanoi and Ho Chi Minh City, the risk of bodily harm to sober, law-abiding foreigners in Vietnam should probably be considered minimal. Everywhere we went, people were friendly, staff at our hotels addressed us by name as we came and went, and they were eager to help us navigate our way to our planned activities. In other words, more than 40 years after the end of the Vietnam War (they call it the American War), and more than 20 years after the United States and Vietnam normalized diplomatic and trade relations, the Vietnamese seem nonplussed by American visitors. More than 7.9 million international tourists visited the Southeast Asian country last year, according to statistics from the Vietnam National Administration of Tourism website, almost a 10 percent increase over 2014. Leading the pack were China (more than 1.7 million) and Korea (more than 1.1 million). More than 491,000 Americans made the journey last year. Through May of this year, more than 4 million tourists have already entered the country, 20 percent more than this time last year. If this pace continues, the number of travelers for 2016 should top 8.5 million, VNAT predicts. According to the World Bank website, $7.3 billion in international tourism receipts were pumped into the Vietnamese economy in 2014. “Timeless Charm” has been the tourism marketing slogan since 2012. The colorful logo features the lotus, Vietnam’s national flower. There are lingering differences between the north and south in this once-divided country, but in modern everyday life, the toll the war inflicted seems to have receded into the background. Learning English and welcoming the American greenback are in fashion. One of the young women at our hotel in Hanoi spoke to us briefly of her family, saying that in the French colonial period of her grandfather’s time, everyone studied Francais. Not anymore. At no time did we feel our personal safety was at risk, other than from vehicles large and small darting to and fro, and particularly in HCMC, where scooters intentionally jump the curb and are recklessly driven on sidewalks. Pedestrians beware. Nor did we detect even the slightest animosity as we ate at restaurants and wandered into shops in both cities. Tourists should be on alert against scams and ripoffs, but sound pre-trip research should lessen the possibility of becoming a victim. We met a couple of guys from New Orleans who were staying at our hotel in HCMC, many Canadians, Australians and a smattering of Europeans, and no one we talked to had a bad word to say about our hosts. The welcome mat is out, and as evidence, I offer this vignette. Among the goals we wanted to accomplish our first day in Hanoi was to purchase a SIM card to fit Susan’s iPhone. We’d been advised that Viettel, Vietnam’s largest mobile network, was a reputable company to deal with, so after our morning visit to Ho Chi Minh’s mausoleum, we headed back on foot toward the Old Quarter, keeping our eyes peeled for a Viettel shop. Locating one wasn’t a problem, but the language barrier was. The words “SIM card” were uttered repeatedly, we pointed at the phone, gestured a bit, and ended up at the shop’s back counter, where several young female employees were seated. We couldn’t get across that we were looking for a card that would provide the ability to access data (i.e. Google) and calling capabilities. After about 15 minutes, we said “thank you” and exited the store. We were walking generally southeast, and this put us very close to Hoa Lo Prison, aka the “Hanoi Hilton,” where American POWs, including John McCain, were imprisoned in the mid-1960s and early 1970s. A couple of wings of the buildings remain, and they’ve been turned into a museum. We did the full tour after we concluded our SIM business. A block northwest of the former prison loom the skyscraping Hanoi Towers. On the ground floor of one is the lobby for the Somerset Grand Hanoi (49 Hai Ba Trung St.), which features 185 “luxury” serviced apartments, perfect for a longterm stay in the city. I figured it was likely someone at the reception desk would speak English, and might be able to direct us to someplace that could help with the SIM card. It also probably would be beneficial if we didn’t disclose right away that we weren’t guests there. The staff did indeed speak English. One of the women rifled through some drawers behind the reception desk, and almost immediately offered a SIM card. Unfortunately, it didn’t cover calls and data. One of the bellhops to the rescue! He “knew somebody,” whom he offered to call, and he was sure this person would have what we were looking for. All we had to do was take a seat in the cushy lobby. The bellhop spoke some English — he confessed he’d like to visit the United States — so we chatted amiably while we waited. I was impressed with his “can do” attitude and cheerfulness. In about 10 minutes, his “contact” arrived, and there ensued more miscommunication about what we were trying to buy. It seems the contact hadn’t brought the right SIM cards either. More back and forth dialog between the bellboy and his contact, and we were informed that there was a third person who might be able to help, but that it would take about 20 more minutes. By now, including the Viettel stop, we’d been at this at least an hour. We decided we didn’t want to wait that long and would try somewhere else, when, magically, the bellhop said his friend would call someone and he would be there in five minutes. And he was. A tool for cutting the card to the right size was produced, the card was trimmed and installed, and voila, we were SIM situated for Vietnam. There was some confusion about how many megabytes the card held. We were initially told 3MB, but then it seemed some sort of promotion ramped that up to 9MB. Whatever it was, for 150,000 Vietnamese dong (about $6.60), it was a good buy. The megabytes held out long enough that the card was still functional throughout our visit to Ho Chi Minh City in the waning days of our trip. The body of Ho Chi Minh, a founder of the Communist Party in Vietnam, is preserved in a glass sarcophagus in this building. My friend Susan and I recently returned from a fascinating two-week trip to Vietnam and Cambodia. I did months of online and guidebook research, compiling and sharing with her the most pertinent information. Every flight, hotel and service provided was booked online. They all came off without a hitch. Susan took the lead in gathering information about restaurants and organizing a textile tour in Siem Reap, Cambodia. If we didn’t make a beeline on our first morning in Hanoi to see Ho Chi Minh’s mausoleum, we’d miss the opportunity completely. The mausoleum is open only limited days and hours, and this first morning was the lone window where our itinerary synced with that schedule. What jet lag? Several cups of very strong Vietnamese coffee later, we were in a time-saving taxi heading west from the Old Quarter to the site, one of the most visited in all of Vietnam. Many Vietnamese deeply revere Bac Ho (Vietnamese for “Uncle Ho”), the first president of North Vietnam and a founder of the Vietnamese Communist Party. The taxi turned out to be a good idea, because as we approached, we could see that the line went on and on and on … for blocks. We would have wasted valuable minutes just trying to find the end of the queue. We joined the line by 9:30 a.m. It moved in fits and starts, and Susan and I had moments where we were wondering if we had arrived too late for the morning viewing. We weren’t the only Westerners; we heard Hebrew, German and possibly Swedish or Dutch being spoken. Trying to pick up the different languages helped pass the time. Also among the visitors were several groups of well-behaved Vietnamese schoolchildren, wearing matching jackets. Some were also sporting white garrison-style caps. The morning was overcast and comfortably cool, and the shaded walkway closer to the entrance had overhead fans, though they were not running on this day. As the line progressed, we passed two colorful tile mosaics on buildings’ exterior walls. One features a line of smiling schoolchildren approaching a woman clad in a blue and white ao dai, the traditional dress of Vietnam. Two fish in a red-blue-green pool of spiraling tiles are frolicking at the bottom. Behind the woman is a fruit tree, possibly orange, heavy with light yellow orbs. The other mosaic looked to be promoting the unity of Vietnam. Two women, one in a white ao dai and the other in a red blouse and black trousers with a checkered black-and-white scarf around her neck, meet in the center, extending single touching hands. Beneath them is a little boy holding an open book above his head. At left, a woman in a skirt and a headpiece may be representing the hill tribes of northern Vietnam and at right, a woman wears a more modern, sleeveless green dress with three red stripes. In the center background is the Vietnamese flag and several white doves. Finally, a little past 11 a.m., we climbed a long flight of stairs and entered the imposing, marble-columned building. Its location at Ba Dinh Square, with its lengthy parade ground, is also significant to Vietnam’s history. It was here that Ho Chi Minh read the country’s declaration of independence in 1945. Four military guards in crisp white uniforms stand a short distance from each corner of the coffin. In single file, visitors enter the cool, darkened room and walk slowly past one side of the glass sarcophagus. You can just make out a frail figure with a long, wispy white beard in a white (or possibly khaki) suit. The line then passes the top end of the coffin, and continues down the other side, having made a U-shape, before exiting through a different door. Also at the complex: the Ho Chi Minh Museum (above), Ho Chi Minh’s Stilt House, Presidential Palace (not open to the public) and botanical gardens. Again, these buildings are open limited days and hours, so plan accordingly. Was a 90-minute wait worth a five-minute viewing? Let’s put it this way: My odds of getting back to Hanoi are slim, so it’s one of those things I would have regretted if I hadn’t done it. Quick reference: Open 8 to 11 a.m. Tuesdays-Thursdays and Saturdays-Sundays. Closed September 4-November 4, when it’s believed Ho Chi Minh’s embalmed body goes to Russia for “maintenance.” Free. Visitors are required to leave backpacks and cameras at different checkpoints. No pictures are allowed inside the mausoleum. Visitors are advised to be silent and keep their hands out of their pockets. Dress respectfully; no shorts, tank tops or hats. Guards enforce the dress code. A taxi from the western side of the Old Quarter costs about 42,000 Vietnam dong, about $2. On the third day of the Sanja Matsuri, the three largest mikoshi (shrines) are taken from the temple early in the morning and paraded around the Asakusa neighborhood of Tokyo. Each shrine is solid wood and weighs thousands of pounds. This time everything was familiar: The costumes, the bruise-inducing mikoshi and the manic energy that is the Sanja Matsuri in Tokyo. The annual festival takes place in May, usually the third weekend of the month. This year’s festival began today, and runs through Sunday. It’s being held a weekend early because of “security issues,” according to the Yomiuri Shinbum. It reported that the Metropolitan Police is prepping for a Group of Seven summit scheduled for May 26-27 in Ise-Shima, and some of its focus may be directed there, not at the Sanja Festival. President Barack Obama will be attending the summit. He will also be visiting Hiroshima, the first sitting American president to tour the city over which the world’s first atomic bomb was detonated on Aug. 6, 1945. But back to the festival, which is a sometimes-raucous, always colorful affair that celebrates nature and includes prayers for a good harvest. Parties with friends and neighbors and a good deal of drinking enhance the atmosphere. It attracts huge crowds — estimates run to 1.8 million or more — of locals and visitors alike. In May 2014, I was back in Japan, my fifth visit to the island nation, and I had planned my itinerary to coincide once again with the Sanja Festival. This time I wanted to see the third (and most important) day, when the three largest solid-wood mikoshi, all weighing thousands of pounds, are brought out from the Asakusa Shrine in the early morning, paraded around the community’s streets and returned to their resting places with much fanfare after dark. I was first invited to participate in the festival when I met my host family in 1999. And by participate, I mean be dressed in the costume representative of my host family’s neighborhood so that I could help to carry a mikoshi — a portable, house-shaped shrine in which it’s believed a deity’s spirit resides — around Asakusa, one of the oldest and most historic areas of the Japanese capital. I wrote a lengthy article titled “At Home in Japan: How a festival, two costumes and animated visits with a Japanese family forged a new friendship,” about my experience. It was the lead story in the Aug. 8, 1999 Travel section of The Atlanta Journal-Constitution, where I worked as a copy editor and slot editor. I met my host family through a Home Visit System program run by the Japan National Tourism Organization. Sadly, the opportunity that was to provide me with such special memories no longer exists as JNTO has discontinued the program. In 1999, I attended the first day of the festival by myself. An early afternoon parade with hundreds of participants slowly moved down Nakamise-dori, culminating at the Buddhist Asakusa Kannon temple, also known as Senso-ji, one of the most-visited sights in Tokyo. The Asakusa Shrine is part of the complex in northern Tokyo. Many floats, some with musicians playing flutes and drums, geisha in exquisite kimonos, and troupes of dancers traversed the route. Particularly evocative were the eight women dressed to resemble swans. A woman dressed to look like a swan proceeds down Nakamise-dori during the opening day of the Sanja Matsuri in 1999. The women were wearing white face powder with bright red lipstick, light blue-green trousers gathered above the ankle and white blouses. Stopping at a designated spot, each woman raised her arms above shoulder height, allowing the fluttering white wings to be fully extended. Faux straight white hair drooped down from both sides of the brim of a low-sitting white headpiece, the top of which reached skyward in the shape of a swan’s long, slender neck and head. Not only did the headpiece look uncomfortable, but it likely took many hours of practice for each woman to master balancing it while walking gracefully. The next day I met my host family’s older daughter and she escorted me to their home, where a party with a mix of Eastern and Western guests was under way. I understood that we’d be going to watch the mikoshi being carried around the streets. But when my host mother said it was time to “get dressed,” I knew something far more interesting was about to happen. In minutes, I found myself, Cinderella-like (but without the gown), transformed into a mikoshi-carrier. I was wearing a patterned blue-and white blouse, over which was a denim vest with a front pocket, on top of which was a matsuri-hanten, a thigh-length coat (sometimes called a happi coat) worn during festivals. In the center of the back of the coat is a symbol or crest, which indicates a community group. Somehow I squished into tight denim, capri-length pants. My host mother tied into place a hachimaki (headband) and I slipped on dark blue, split-toed tabi (foot coverings) to complete my costume. Only people so dressed are allowed to carry the shrines. It’s also a great privilege as a gaijin (foreigner) to be included. Once on the street, the younger daughter of my host family helped get me into position, tightly sandwiched single file among similarly dressed men and women, more than 30 of us, to carry the mikoshi. I was under the outer left side of the long railings, which meant that my right shoulder was in jeopardy. My immediate task was to pick up the rhythm of the jolting movement and sing the chant that was supposed to keep us in unison as we advanced snail-like down the block. At this point, the mikoshi was essentially bouncing, and with every downward motion, it hit the top of each porter’s shoulder. This repeated contact left a bruise that took a week to disappear. Yes, wood hitting bone protected by only three thin layers of cotton hurts. A patterned clap called ipponjime´— three sets of three claps in quick succession followed by a single clap — was performed as we passed permanent shrines. It was also executed when porters switched en masse, and when the shrine reached the small building where it spent the night. I lasted only about a half-hour as a porter. When I stepped out of line, someone else quickly rushed in to take my place. We followed this shrine — more than 100 are carried around the ward — for about two hours. When the shrine was safely home, each porter was given a soft drink or beer and a sealed pouch of fish stew. We reconvened at my host family’s house and the party resumed. I sensed I had formed a new friendship, especially after a second visit, where my hosts dressed me in a gorgeous kimono and my host mother conducted a solemn Japanese tea ceremony for me. Fast forward to 2014. I joined my friends for the Saturday afternoon and evening festivities, less formally dressed, but wearing the all-important matsuri-hanten. I got to help carry the mikoshi — still not very skilled with the rhythm and chant — and was delighted to have this opportunity again. My host father noted proudly that the parade route this year came down his family’s street. So when we took a break from ground-level fun for more food and refreshments at home, we were able to watch and take photos from their second-floor balcony as the mikoshi passed. Sunday dawned clear and bright. Except for the headband, I was properly in costume. My friends were hosting their usual blend of guests, including a French freelance journalist who divides her time between Paris and Tokyo, and a group of her friends from Switzerland. I let them know that they were in for an exhilarating experience. What probably surprised me the most was that my host mother had enough costumes for everyone and that they were large enough to fit the Swiss, several of whom were at least 6 feet tall, which is several inches taller than the average Japanese. An international group of shrine-carriers gets into the chant and rhythm of the Sanja Festival. The Swiss group’s shoulders were probably bruised more than the other porters because their height meant the railing was hitting them first, and in some cases was not making contact at all with the shorter carriers. Nonetheless, it was obvious the Europeans were enjoying the whole vibe as much as I had in my debut 15 years earlier. After the first round of mikoshi carrying, the Swiss, who had arrived in Japan early that morning, were spent. Their faces glowed rosy from the exertion and a touch of sunburn. Sated with the latest refreshments, they changed back into their clothing, heartily thanked our hosts, signed the guest book and departed. The rest of us soon headed back downstairs because we could hear the drums and flutes that signaled the approach of one of the big shrines. (The other two were winding their way around different parts of the Asakusa neighborhood.) Thick crowds were accompanying it, clogging the narrow streets with wall-to-wall people. I was intimidated by the mikoshi’s size and the number of people needed to carry it (see photo at top of post) — at least 80 or more; mostly muscular men — so at first I declined to join in. My host family’s older daughter re-emphasized how big an honor it was to carry the largest mikoshi, and with that sort of encouragement, how could I not try? However, I was right to be concerned. Once in place, I felt crushed beyond sardine standards and it was apparent a lot of the porters had been drinking, as is the custom. I feared that a tangle of legs and feet could have disastrous results. Simply put, I was scared I might be trampled if I got even slightly off the rhythm and tripped. So after a few minutes, I jumped back out of line and retreated to a safer spot. My host family’s younger daughter and her 11-year-old son were braver, carrying near the front of an interior railing, but they’d had many more years of practice and participation under their belts. Eventually, I was back on the balcony, taking photos, and chatting with the remaining guests. The father-in-law of my host family’s older daughter perked up when he heard I was a journalist — he had been an editor — and one young Japanese woman who had taught English was eager to talk about the United States. By twilight, it was time to walk to the area of the temple where the three large shrines would return, one at a time. While the grounds are normally open to the public, only those in costume can witness this festival-ending task. The complex was positively radiant, with its bright red religious buildings, elevated rows of white papers lanterns and hand-held individual lanterns all illuminated. People gathered in clusters, awaiting the first large shrine. The same rhythmic chant all porters sang earlier in the day could clearly be heard as the mikoshi approached, and with it a bit of danger. The back of the men’s garments show a sampling of different crests representing neighborhood groups. By now it was dark, so ground visibility was lessened. Many of the porters had continued to consume alcohol, and were perhaps a bit unsteady or possibly drunk. And everyone was tired from the day’s physical exertion. Our chief mission was to stay out of the direct path as the mikoshi circled several times en route to the Asakusa Shrine, its home. Keeping our distance meant I didn’t get a satisfactory photo, but our safety was more important. Once parked, a group of men quickly began to disassemble and undress the mikoshi, starting with the seven decorative pink ropes bound around the center portion of the “house.” Officials were herding us toward the exits in anticipation of the arrival of the second large shrine and its followers, so we didn’t get to see the rest of the accoutrements removed from the mikoshi. The next day, I walked back to Asakusa Shrine, hoping to get a photo of the three large mikoshi sitting side by side by side. Alas, it was not to be. Full-length wooden doors hid them from view. The 2017 Sanja Matsuri is tentatively scheduled for May 19-21. It’s never too early to start planning. Copyright 2016 text and letter. All rights reserved. Their song was “Always,” the lilting classic composed by Irving Berlin in 1925. It might have been Lois Simon’s youthful voice caressing those words that got Elliot Gordon’s attention, or perhaps the figure-hugging, red wool dress the petite soprano was wearing that day in 1943. Or possibly both. What is unmistakable is that the New Jersey teenagers had caught each other’s eye after meeting at a party at Lois’s cousin’s house. A few months later, he was inducted into the Army Air Corps, at the height of World War II. He had his sights set on becoming a navigator or bombardier. She was finishing her senior year in high school in Passaic, New Jersey. And so began a long-distance courtship that was to be conducted mostly through the more than 600 letters they exchanged over about 20 months, a few brief phone calls and Elliot’s occasional furloughs home. The correspondence traces not only the progress of a budding relationship, it gives insight into life on the home front during a period of enormous worldwide upheaval, when America and its allies were fighting to defeat the Axis powers of Germany, Japan and Italy. The early letters are somewhat stiff and formal as Elliot and Lois get to know each other, and they describe their daily routines, their families and the people with whom they regularly interact. They become more evocative and more richly textured as they begin to rely on each other for emotional support as things don’t go quite as Elliot had hoped with the Army Air Corps and Lois tackles her freshman year of college in West Virginia. Elliot wrote these words to Lois on April 27, 1944, as he was going through basic training at Keesler Field in Mississippi. Lois fulfilled Elliot’s request, and then some. She later made the same request of him, and was ecstatic when his photos arrived and she could show them to her university friends and display them in her dorm room. 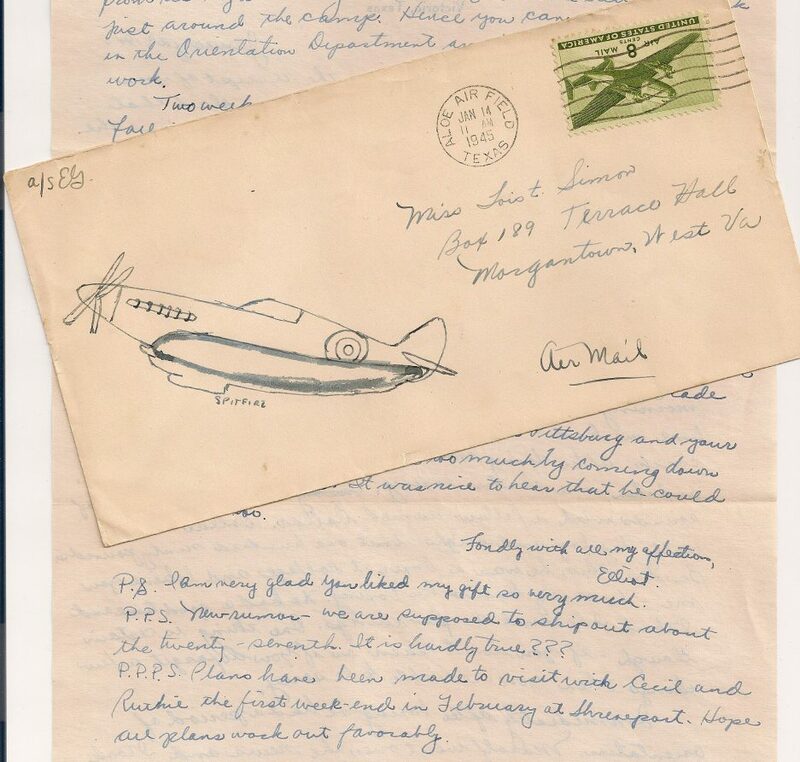 I am the keeper of these letters now, plus countless pictures and other memorabilia, including a very special bracelet that Elliot made for Lois from scrap stainless steel while posted for much of the war to Aloe Army Air Field in Victoria, Texas. Organized chronologically, each page of each letter resides in its own acid-free plastic sleeve, and together they fill eight large binders. I’ve read every word of every letter — twice — taking full advantage of being accorded the rare privilege of “meeting” my parents as teenagers. In my book, “Fondly with All My Affection: A World War II Love Story,” I draw on the letters to profile Elliot and Lois as they evolve from being two individuals separated by thousands of miles to a newlywed couple attending college and working together in a post-war world. My manuscript includes about 60 full-text letters that Elliot and Lois exchanged, but that’s only part of the story. Elliot’s twin brother, an Army infantryman who earned a Bronze Star while fighting in the Pacific Theater, figures prominently, as does their next-oldest brother, an officer in the Army Air Corps. Further, I’ve written a chapter about some of the other young servicemen, scattered around the world, that Lois wrote to before and after she met Elliot. For the past year, I’ve been actively looking for a literary agent to represent my book. In future posts, I’ll be writing more about “Fondly with All My Affection,” my world travels, the books I’m reading, and what food I’m cooking and eating. And anything else that strikes my fancy.